TRIBAL COLLABORATIONS CD ON-SALE NOW! Contact WildCard BellyDance | Cool Belly Dance Links! TRIBAL COLLABORATIONS CD ON-SALE NOW! 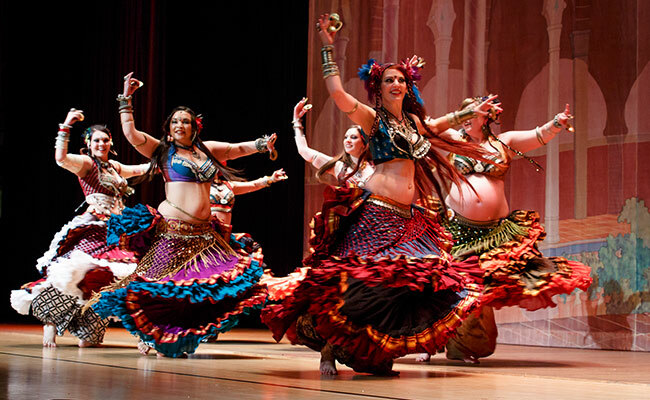 WildCard BellyDance teaches Tribal Style belly dance lessons and workshops for belly dancers of all levels and abilities from the beginner to advanced in Sonoma County, California and beyond. The women of our troupe have been dancing and teaching together since 2005. In 2009 we created a new ITS (Improv. Tribal Style) belly dance format which has been fully incorporated into our weekly belly dance classes. Classes are held twice weekly on Mondays and Wednesdays just south of Santa Rosa at the Community Center, Room 3 in Rohnert Park. Our class location is near highway 101 and easily accessable to students from Petaluma, Sebastopol, Cotati, Healdsburg and the wine country of Sonoma County. WildCard BellyDance ITS format is taught in ALL levels! Level 1 is where to start. Level 1 gives you the foundations to build from. Even dancers experienced in other forms of belly dance will need to start with level one in order to learn the vocabulary of movements that make up the foundation of our dance. Level 1 will be based on a more traditional *ATS® format with our own WildCard BellyDanceSM twists. In level 2 is for the for the intermediate dancer. You will learn more moves as well as learn how to "lead" and "follow", transitions, different formations and to dance as a group. previous level 1 in our format required. Level 2 will also be learning more advanced new moves in the WildCard format. Level 3, for the advanced dancer. Level 4 is for troupe time. Any Classes listed as Level 4 are not open to the public. Drop-Ins: $16.00 per class - pay as you go. **Drop-Ins for Levels 2 and 3 must have have instructor approval. Pay teacher in class on first day. Check or Cash (exact, please). Pre-register: Pay the Rec Center directly, in person, by phone or fax. Drop-ins, pay as you go, check or cash (exact, please). Community Room 3 in the Rohnert Park Community Center. If you have already filled out a customer record with the Rec Center, then you can call in your registration. If you haven't yet filled out anything, you can request the proper forms by fax. Just call the Rec Center and ask!